CM: During her studies at the Athens School of Fine Arts Mihailidou underwent osmosis which eventually led to an original yet natural outcome. The particular manner of Mihailidou consists in the combination of the realism with the placard effect, and the way in which both are combined in a shared space. The realistic element in the case of The Lesson is the trace of the erased writings on the blackboard. Mihailidou collects elements for her pictures like a reporter at work on a reportage. She takes photographs from the press and processes their composition into a picture with the help of a computer. Then she represents the composition with surgical precision as a colorless sketch, onto which she subsequently applies colors. The work becomes an extension of her perfectionist self. In the course of making the painting becomes increasingly abstract. Hence the desks turn to loose their supports. This way her painting attains more of a conceptual feel. In the end what remains is the truth she is interested in. The aim of Mihailidou is to create a powerful picture with economy in its constituent parts. She is also interested in a caustic humor, which she wishes to bring forth not directly, but in a special 'subterranean' way. The Lesson is a critic on the disputed issue of the relationship between education and politics. 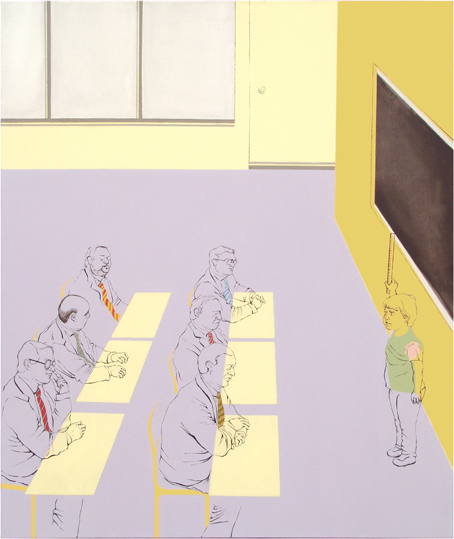 In representing what seems to be an ordinary classroom Mihailidou replaces the students with the adults. The young boy in the place of the teacher is larger in scale by comparison to his seniors. Moreover she makes the older ones appear blind, while endowing the young teacher with fine sight and eyes wide open. What is more, the young one appears to have more courage than his elders. The artist herewith 'employs' a lie to suggest a potential truth; that youth may be wiser than the supposedly wise.